Finnish newspapers start the weekend with looks at super-costly prescription drugs, positive and negative views of a conservative Lutheran sect, road accidents and a sleuth of bears in Suomussalmi. The leading provincial daily Aamulehti covers demonstrations against President Donald Trump in more than 40 US cities on Sunday, as well as Turkish activists who went ahead with a Trans Pride Parade in Istanbul despite a government ban, and a fire at a vast refugee camp in scorching-hot Lebanon. On the domestic front, AL says the Social Insurance Institution (Kela) is seeking a way to help those dependent on extremely expensive prescription drugs. A new pharmaceutical reimbursement system that took effect at the beginning of this year has caused severe problems for about 30,000 patients. They use some of a group of 220 drugs that cost more than 1,000 euros per packet, used to treat conditions such as MS, cancer and rheumatism. The new law only allows reimbursement to be approved a month at a time, which sometimes results in patients having to pay out-of-pocket – if they can afford it – and then hoping to be recompensed later. On the west coast, the Pori daily Satakunnan Kansa covers the ongoing Summer Services gathering of the Conservative Laestadian movement of the Evangelical Lutheran Church, which has attracted bigger crowds than expected. Some 60,000 to 70,000 people were expected to attend the annual revival meeting. As of Saturday evening, organisers counted more than 87,000 people – compared to Pori's total population of 85,000. No significant problems have been reported, but traffic jams are likely as the event ends on Monday afternoon. Delays are especially likely on Route 8 north of Vaasa due to road work. The paper also interviewed a 29-year-old woman who describes her relief after leaving the Conservative Laestadian movement in which she was raised. Marjo Jääskeläinen explains that she was hospitalised with severe depression, which she attributes to her oppressive upbringing. She has set up a peer support group in Rovaniemi for those who've suffered trauma during childhood and young adulthood as members of fundamentalist religious groups. The tabloid Ilta-Sanomat reports on a school in Askola, near Porvoo, that caught fire for a second time overnight. A small earlier fire had been extinguished at the Monninkylä School, but later on Sunday night it again burst in flames despite the presence of one fire-fighting unit. This time at least half of the building was destroyed by flames and water damage. Two or three individuals were seen heading away from the school after the first blaze. IS also reports on accidents around the country, including the death of a man who crashed early Monday while driving a stolen car in Pargas on the south-west coast. Another person was injured when a car was struck by a train in Tervola, western Lapland on Monday morning. Train service in the line is expected to be at a standstill for hours. 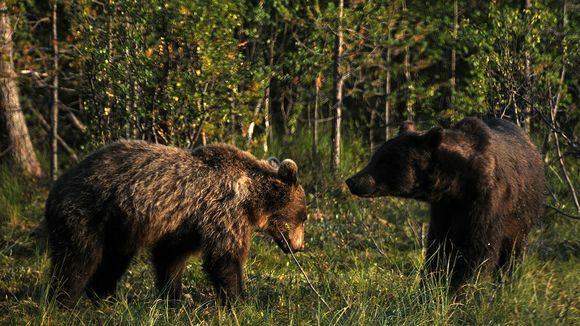 On a more positive note, IS interviews a woman who photographed 17 bears on Friday night in Suomussalmi in the eastern Kainuu region. Between 7 pm and 1 am, she and a few others saw up to a dozen peaceful bruins at a time from a photography hide set up on Raatteentie. The paper has published a selection of her photos, including some of curious cubs.